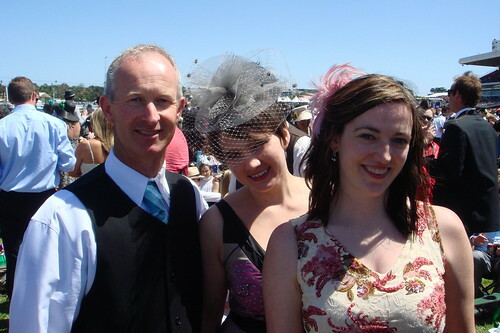 I'm a past due with this update as the Melbourne Cup was way back on November the 4th, but here it is anyway. 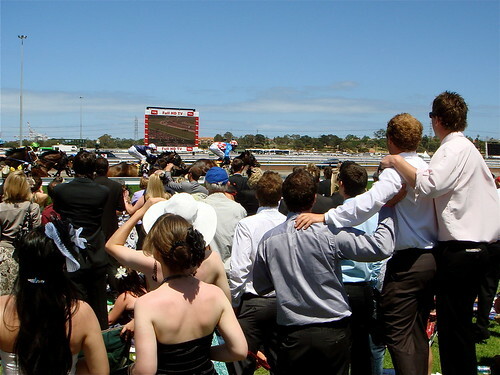 Over 100,000 well dressed Mebournians were at Flemington Racetrack for the Melbourne Cup, just one of many days in the spring racing season which happens all over Australia in November. As you can imagine in a crowd that big, the people-watching opportunities were fantastic. I was escorted by cousins Elizabeth and David, who I hadn't seen for ten years. It's hard to describe the event... Picture The Prom combined with Cherry Blossom Viewing festival plus a little Vegas betting. 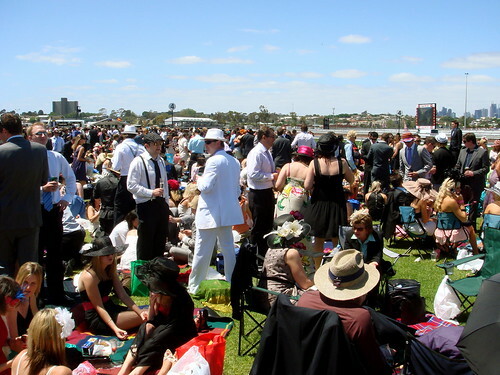 Everyone's pinicing and drinking champagne on the grass in fancy dresses and hats, occasionally jumping up to cheer on the horses as they thunder past. There were three American entertainment celebrities in attendance. The blond from Queer Eye for the Straight Guy was there. He judged the best dressed lady from the crowd - she won a new Saab convertible just for her great outfit. Candace Bushnell, author of SATC was also present. And, for some reason, Snoop Dogg was there. 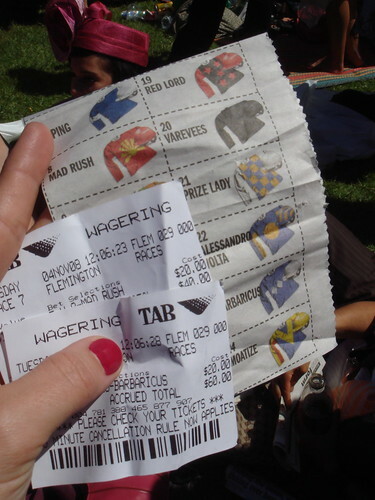 Apparently, he bet $500 on the same losing horse I wagered $40 on. 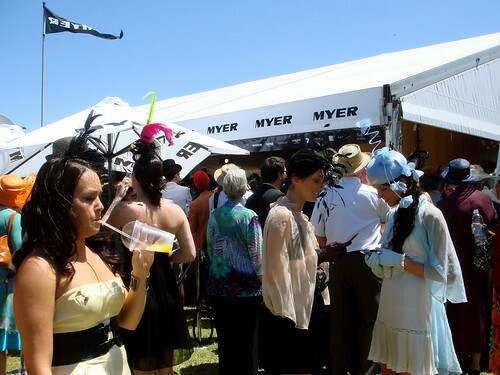 I always love an excuse to dress up, and for that reason alone, I'd make The Cup a yearly event if I lived in Melbourne. Hats for the ladies are the biggest deal. 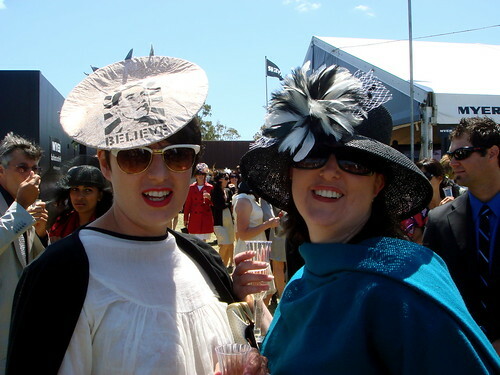 Be your hat wide and flat or feathered and tall, you must have something on your head. The coordinating dresses, shoes and accessories are all carefully planned out. 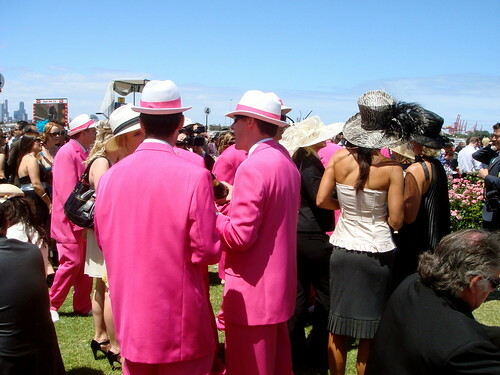 The gents can get in on the fashion scene, too, with eye-catching suits and trilbys or fedoras. 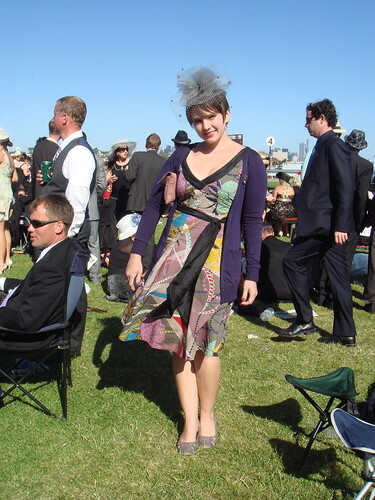 Here's my outfit: the dress is from Anthropologie in Chicago and the fascinator was purchased in Melbourne shortly after I stumbled off the plane. I had a terrific time with my cousins at The Cup! 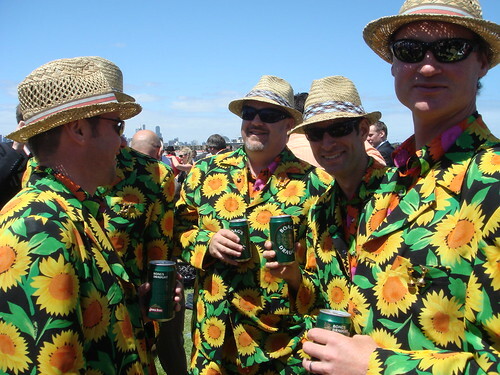 What a great way to celebrate spring and sport, friendship and fashion! More photos and video here!